This week I finally completed a Pinterest project I have wanted to tackle for weeks, make Cloud Dough. This was one fun and messy project that I let my 21 month old son help with. His help most likely caused the messy part. LOL It was all worth it because he had a great time and proved himself a pro at the mixing bowl. 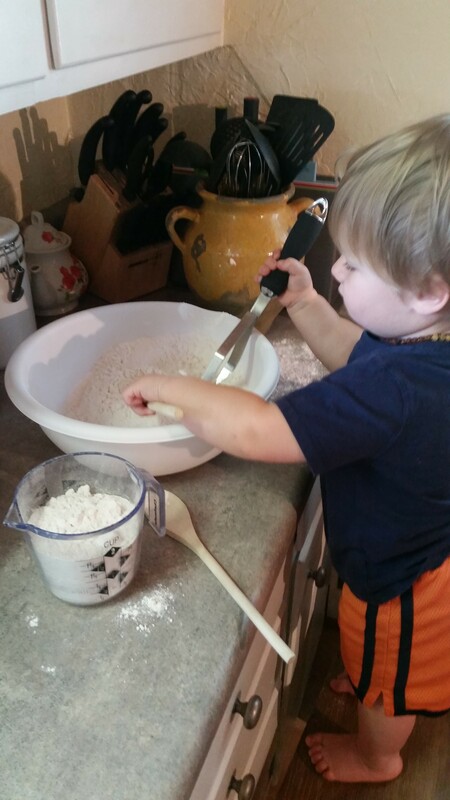 The recipe I used is non-toxic, making it Toddler friendly. If your young ones are anything like my little guy then they will partake in a few taste tests. Okay, are you ready? This is super easy. 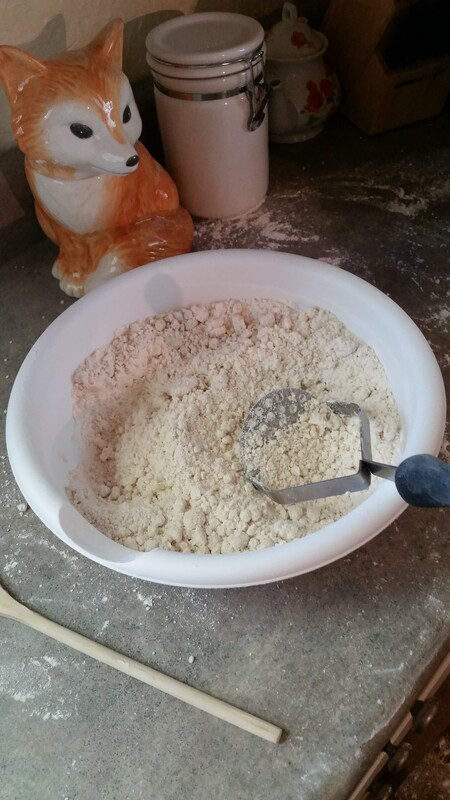 Gather a large mixing bowl, measuring cup, bag of all-purpose flour, vegetable oil, spoon or spatula, and potato smasher or pastry cutter. First pour 8 cups of flour into the mixing bowl. The original recipe I saw said to use 1 cup of vegetable oil but I found I needed to add a little more. I used an additional ¼ cup. I suggest start with 1 cup and go from there. 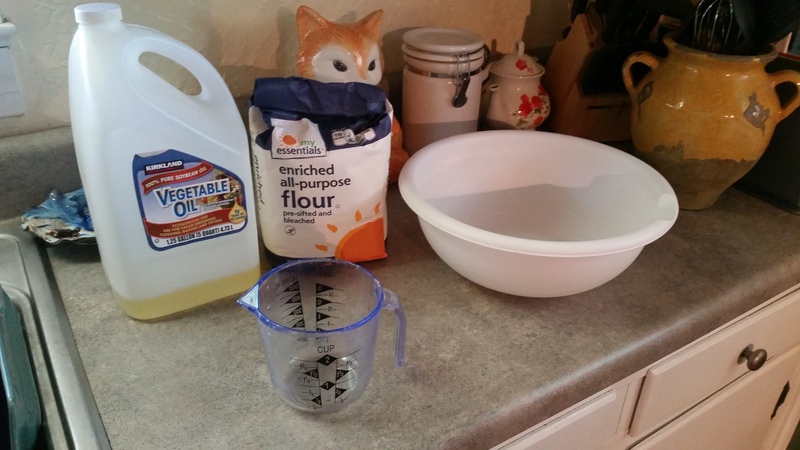 With the spoon, mix the flour and oil until oil is mixed in well. Then use the potato masher to work the ingredients together so the cloud dough comes out feeling soft and silky. You should be able to mold it in your hand, the same way you do with wet sand. Be forewarned, initially this cloud dough is going to smell like you’re about to cook fried chicken. This totally works here in the South! Don’t fret; I have noticed the smell weakens greatly by the next day. To last the longest, place it in an airtight container. 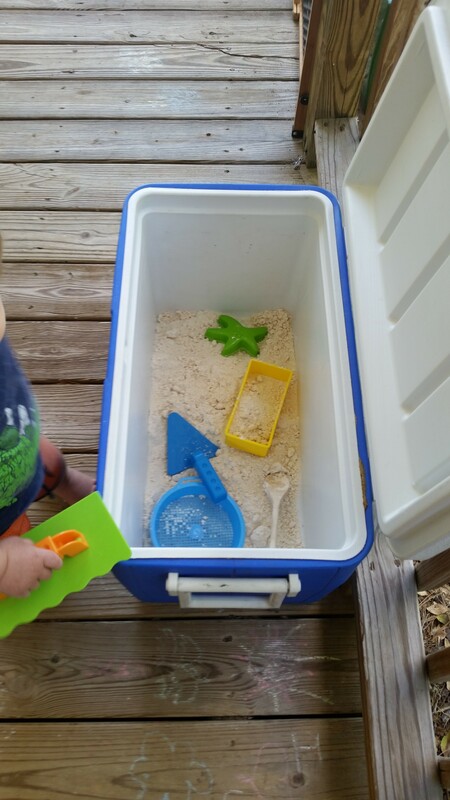 Personally, I put it in a large cooler so my son could play with it easier. Plus, it contains the mess better! I took the cooler outside to play with but brought it back inside the rest of the time. I don’t think it would last as long if left outdoors. I can’t be sure how long this stuff will stay “good”. Currently, our cloud dough is 5 days old and still in good shape. Just for my own piece of mind and what common sense is telling me, I will most likely get rid of it tomorrow. Any food product left out like that doesn’t seem to last much over a week. For older children, you can substitute the vegetable oil for baby oil. This change will keep it the same feel and consistence but will smell much lovelier. I have also seen that you can make your cloud dough colored by using a tablespoon of non-toxic Tempera paint powder. Just add it in after mixing the flour and oil together. Then use the potato masher to thoroughly combine the ingredients. This way is still toddler safe. 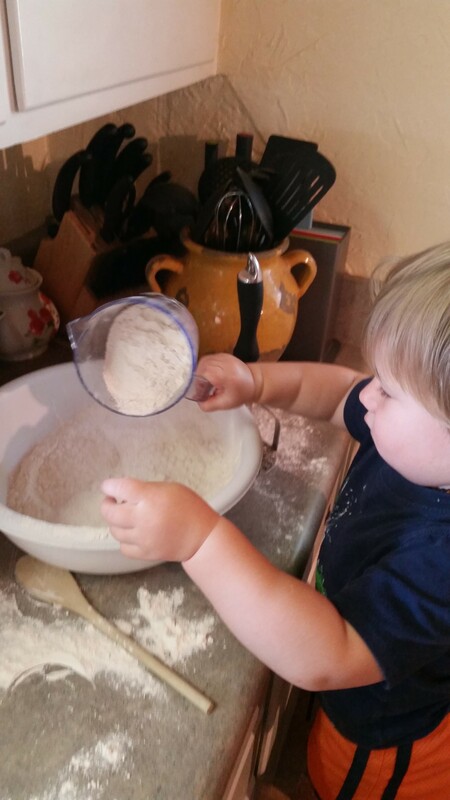 My son loved making and playing with his cloud dough. 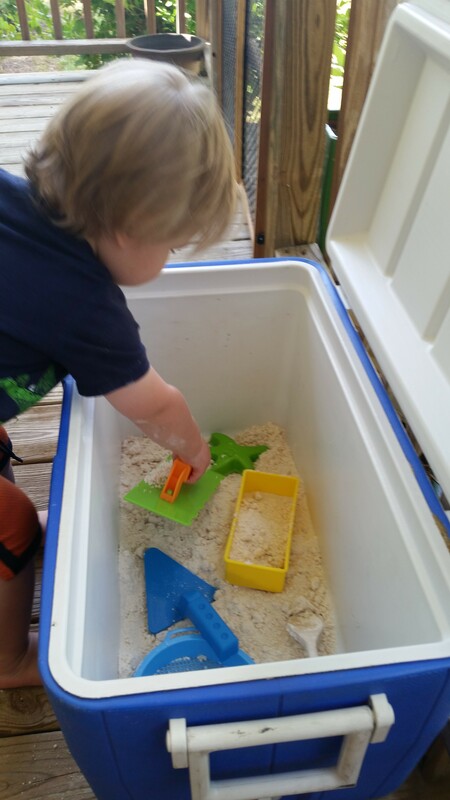 I added beach, or sand box, toys to the cooler and he loved shoveling and making molds with it.